Heather’s not familiar with the running gag. Early on in plotting things out, as far back as when I introduced the Fairweathers even, I considered the possibility of having Barb turn out to be Todd's biological sister. I discarded this idea a long while ago for a variety of reasons, the big one being a bit of a tipping-point on the coincidence/believability meter. They try so hard. lol. Common now Selkie, don’t go and be a brat to people just because you’re upset. Even under the circumstances, there’s no excuse for poor manners. If I had been forced to go to the house and play nice with the parents of the daughter who stole my clothing infront of a new peer group I’d be bratty too. I don’t agree. It was Heather that did wrong, not the Fairweathers. It’s not like Selkie corrected them and told them how they SHOULD pronounce her name and then had it mispronounced again to something like Stephanie (meaning they don’t listen or are treating her as a non-entity). If they didn’t know of course Mr. F would get it wrong too. It’s up to Selkie to tell them what her name really is. Well, see, if you think back, the Fairweathers are the couple at the orphanage that “said Selkie looked weird” and other things while they were in looking at kids. They didn’t think she could hear, but were disrespectful toward her all the same, and that is why she’s angry. Not just because of the Heather situation. And don’t you think that her real name might have come up a few times not only at the orphanage, but also during the whole shirt ordeala nd while Todd was talking to Bard? Also, it seems a lot of people mess up an call her Sophie. I’ve got an unusually name, as well… no matter how many times people mispronounce it, no matter how innocent their intentions, it still aggravates me. I’m not saying that Selkie is justified to be a brat, but there’s an honest reason behind her behavior that doesn’t seem irrational at all- especially from a child’s perspective. Yeah, that plot twist would break the coincidence meter into itty bitty pieces. Heather coming to Selkie’s defense? Maybe – just maybe – this is the start of a friendship? It’s amazing how having to deal with a well deserved punishment will cause someone to look for, and point out, the faults of their punishers. Wonder what that frustrated curse translates as? Perhaps “I´ll eats the next ones who gets my names wrongs!”? Though it´s perhaps a little too short for that. That’s because of her expression and tone of voice. I’m with Heather… What running gag? The mishearing Selkie’s name as Sophie. Have I been asleep for all of it? Oh! Gracias por la bienvenida a House of Buenclima! Aren’t Selkies more Ireland thing than Iceland? They’re actually from both regions. There’s said to be a more creepy version in Scotland too, but I can’t remember the name. Ah mythological creatures, there’s versions of them just about everywhere. I feel for you, Selkie; it usually takes a long time for people to start pronouncing/spelling my family’s last name correctly. XD I’ve been very short with people about it ever since I was little… I can relate to her frustrations. Well, I can understand Selkie’s frustration at being called the wrong name…twice. I am wondering how they got it wrong. Still, they are taking Selkie’s “condition” in a lot better than I expected. I can so relate to this. If people aren’t butchering the pronunciation of my last name, they’re calling me Angela, April, Angie… the list goes on. lol, Anyone with a foreign last name always gets butchered. I’m German and I’ve heard about a dozen different ways of saying it. But I actually prefer the original German. My last name is 13 letters long and very much non-English pronunciation friendly, so on the few occasions I’ve had to have recognized it said by foreigners (like when I visited the States, they called passengers by last names for boarding), I’ve had trouble to 1) recognize it and 2) not die of indignant-but-highly-amused laughter. But I still don’t get how you can make “Sophie” out of “Selkie” – even in English O and E sound different, and in my understanding PH becomes F in that name, whereas K remains a K.
I can kind of see it…in most American dialects of English (and a lot of British ones as well, the notable exception being Irish English), there are two ‘L’ sounds: one is pronounced more towards the front of the mouth (as in ‘leek’) and the other towards the back (as in ‘bell’). Linguists call these the “light L” and “dark L” respectively. The dark L is the also the one that occurs in Selkie’s name. When speaking quickly, or in combination with certain other sounds, the L sound tends to become less distinct. ‘K’, for instance, is also a sound made in a “back” position (on the soft palate), so the ‘L’ (which, of all the consonants, is one of the ones that’s closest to a vowel already) might be heard as more vowel-like, “colouring” the preceding vowel. 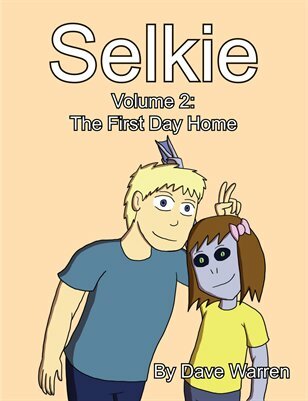 So the ‘e’ of ‘Selkie’ moves backwards in the mouth over the course of the syllable (to approximate the ‘L’ but perhaps not actually articulate it), so by the time the ‘k’ comes along, the vowel is sounding more like the back vowel ‘o’. And since the long ‘o’ of ‘Sophie’ is pronounced as a diphthong anyway (something like Finnish ‘ou’ or maybe Estonian ‘õu’), the two could be confused that way. Especially when considering that what someone expects to hear can affect what they think they hear (since Sophie is such a common name, you might think “oh, he just said ‘Sophie’, but pronounced it a little funny”). (I once managed to convince myself that someone had said “machinery” when what they actually said was “machine learning”.) People are especially quick to dismiss weird vowels: since people with different accents talk to each other all the time, we get used to hearing other people pronouncing vowels differently, so this could be chalked up to a slight difference in accents by a listener. Though it is true, Selkie doesn’t sound like Sophie at all. I have you all beat. My name is David and I’ve been called Daven and Devlyn before. How do you screw up David?! You think that’s bad? People kept pronouncing my name as “Day-bit”! HOW DO YOU GET THAT FROM DAVID?! I´ve been wondering before why people keeping mishearing Selkie as “Sophie” rather than, for example, “Sally”. My name is Tina, I work in a call center, and at least 10 calls a day will say my name as Kim?! Don’t miss that. Not. At. All. I used to work in a call center, and I got called the wrong gender like fifty percent of the time. She didn’t even want to be there, or to have a reason to be there. Life is though like that, take you turns. Having Barb and Todd discover that they’re siblings now might break the believability-meter, but if there’s a sibling out there that Todd (and that sibling) already knew about / figured out a long time ago, that would be less of a stretch. But “believability” also depends on who Todd’s biological parents are. There’s all kinds of reasons siblings might be separated at a young age, and many reasons why they might not find out about each other for decades, or at all. Most of those reasons have everything to do with who the parents are. Oh, also: cousins. And twice removed, etc. There are plenty of possibilities when your most direct family is unknown. Oh, but a name it is, for the weary that wander shall ne’er hear it true. The tongue that cuts deepest is the tongue not of the innocent nor the depraved, but those with a means and a reason to harm. Hear me, O betrayer! Thine time is nigh! Thine wretched words shall haunt your home, rounding the ears of all who walk there, and though one would look at thee and say, ‘Nay, ’tis not wrong, thou art not evil!’ they wilt learn better of thee, O foul wretches that ye be! Beware! Did someone say “running gag”? X-treme! X-treme! Feel the burn! Feel the burn! No pain, no gain! X-treme! X-treme! X-treme!